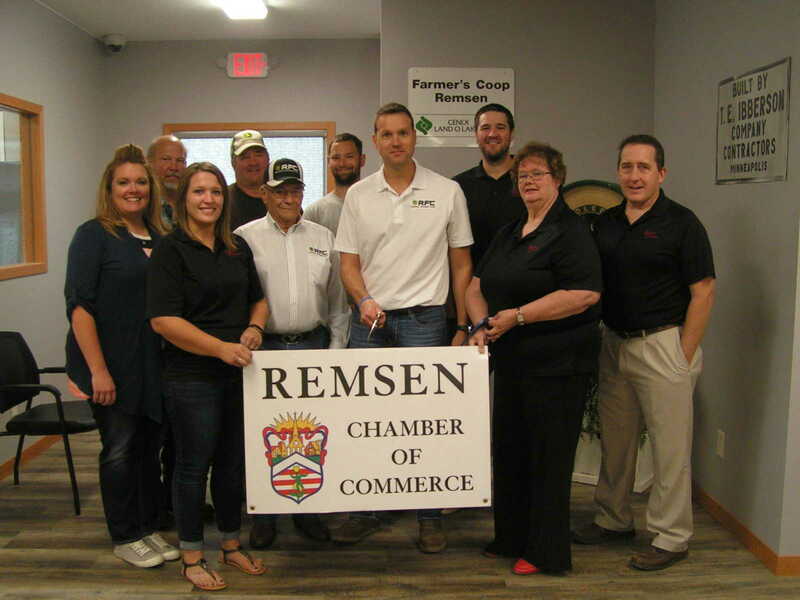 The Remsen Farmers Coop held their Ribbon Cutting Ceremony and Open House for their new office building on Friday, September 21, 2018 from 9:00 - 11:00 a.m. The Ribbon Cutting was held a little after 10:00 a.m. and was taken inside the new space due to the cool and blustery conditions outside with Remsen Chamber board members and Remsen Farmers Coop employees. Pictured above includes: Front row, from left: Remsen Chamber members Stephanie Loutsch and Alicia Hoffman, Remsen Farmers Coop Board President Jim Galles, Remsen Farmers Coop General Manager Jared Ehrp, Remsen Chamber members Karen Harnack and Scott Jones. Back row, from left: Remsen Farmers Coop Director Steve Staab, Remsen Farmers Coop Secretary Mike Harpenau, Remsen Farmers Coop Director Jeremy Ahlers, and Remsen Chamber member Dusty Pick.